Are you wondering how to train farm dogs to guard, help, and herd with livestock? Are you surprised when you’re greeted with booming bow-wows on visiting a farm alerting the owners that an outsider has arrived? Any person working or living in a farm is aware of how vital a dog can be for protecting, gathering and corralling farm animals. An extensive number of domestic dog breeds were originally bred to work as farm dogs. These dogs are known as farm dogs for a reason. They provide camaraderie and extend their protection to help with the movement and herding of farm animals. Livestock guard dogs raised to protect domestic animals from local predators. These two different types of farm dogs have been developed through years of particular rearing, which altered instinctive canine behavior. 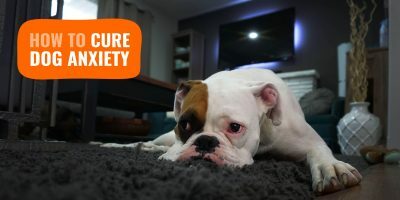 These two attributes that is the social and predatory conduct have been diverted into a working connection amongst dogs and livestock. But, this requires special care and training of herding and guarding dogs. Training and preparing an adolescent herding dog to care for the flock can be a thrilling experience. In the beginning, you won’t believe that such a bumbling, comic little pup will transform into a faithful sidekick and help with livestock gathering and rounding. The chief duty of herding dogs is to help move a large number of farm animals effectively and capable at the owner’s commands. There are many breeds of dogs that are better with sheep, some are better with cattle, and some work with many species of herd animals. Some gathering dog breeds include the Australian Shepherd, the Collie and, the King of all Sheepdogs, the Border Collie. The Welsh Corgi, the Australian Heeler or the Queensland Blue Heeler, Bouviers of Flanders are other popular breeds of cattle dogs. Such herding dogs have been developed through centuries of selective breeding by choosing a set of behavioral attributes. Herding dogs are chosen to portray hunting traits that involve keeping a watchful eye at the livestock, follow, grip and chase them in a certain direction so that these animals don’t go astray. ‘Eye’, ‘stalk’ and ‘chase’ – these are the most sought-after traits when choosing a herding dog. But, care has to be taken before these breeds mature their predatory and deadly crush-bite-kill characteristics. 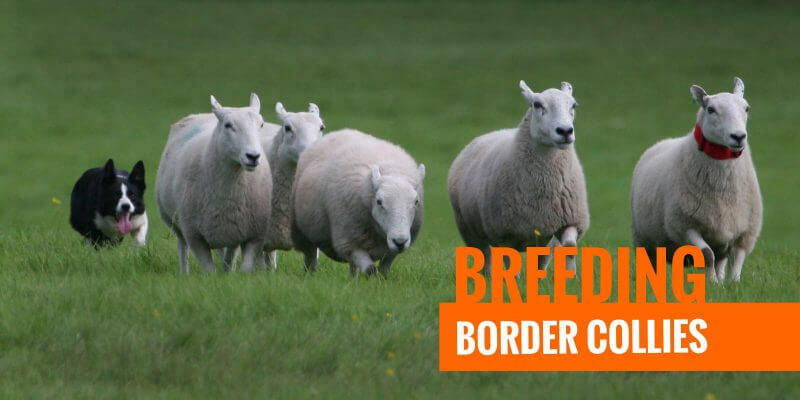 Border collies maintain the livestock in a tight-knit circle and work on the flight zone of the animals, moving the lead with their presence and stare. Their instincts are such that, just on impulse, they position themselves directly across the handler on the other side of the farm animals. When the handlers move to the right, the dog will move to the left and vice versa. This herding sense is a part of the predatory pattern of the dogs, but it can be taught to go out, circle round up the livestock and bring them where the handler is. These characteristics are sought-after in a herding dog but aren’t really used when herding. An acoustic indication such as whistles is used to command herding dogs mainly because these can be heard over a distance that’s generally involved when gathering a large flock of sheep in vast grazing lands. Mentioned below are some tips which you should take into consideration to train herding dogs. Keep A Watchful Eye — The first thing that you must teach your herding dog is to keep a watchful eye. Try to keep your dog away from dangerous or counterproductive situations. Avoid any kind of contact between a young dog and livestock unless it’s under your supervision. It’s fine to keep your dog around other animals while you’re performing other chores as long as you can keep him safe and out of trouble. Always keep in mind that for a young puppy it’s very easy to escape and get at the stock if you aren’t attentive and the results can be disastrous. Training Age For Your Dog — Start training your dog only when he is mature enough to withstand the physical and cognitive rigors of training. The usual age for herd training of a dog is 10 to 12 months, though it depends on the individual dog. If you’re facing problem in training your dog, then don’t get mad at him, maybe he is not ready to get trained right now. 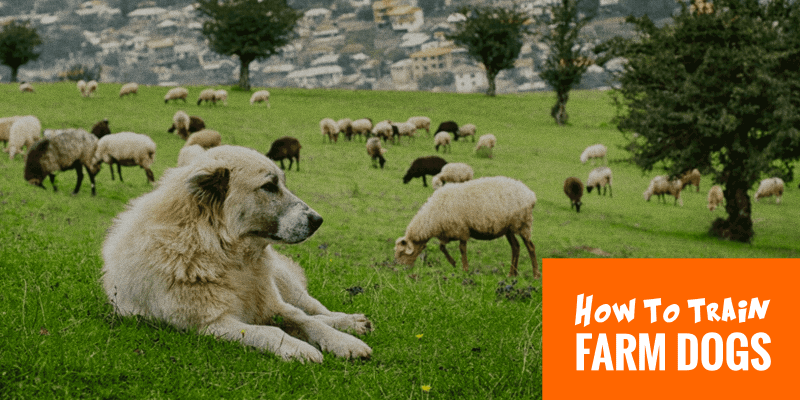 Signalling Your Dog — If you can’t call off your dog when he is chasing one of your sheep through a safety fence toward the highway, you can be in trouble. So before you start training your dog, make sure that you have a solid command over it. 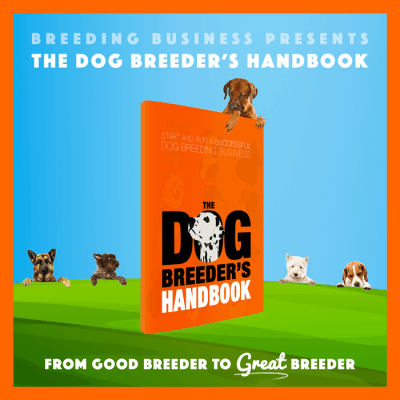 Young dogs often get excited when they first start working with stock and they might not listen to you, but a firm command from your side telling them to follow what they are told will get through eventually in their overactive brain. Also, some farm owners train their dogs to lie down before the training begins. But asking your dog to lie down on the kitchen floor versus out in the pen with sheep racing around the fields is completely different. The physical features and conduct of herding dogs is different than that of guarding dogs. Herding dogs come under the category of 10 to 20 kilograms weight with ears that are more or less pricked. The colour of herding dogs is often dark with white or darker markings however, some breeds are white or grey with darker spots. 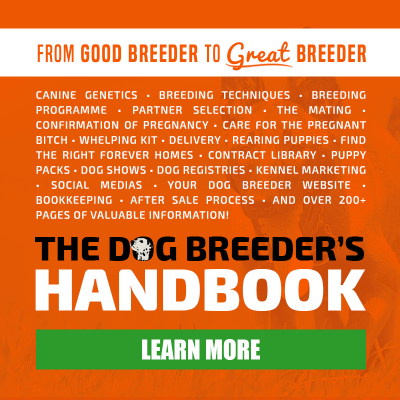 Read our post on how to breed Border Collies! Many farm owners have learned the value of adding livestock guardian dogs to their farms as it gives them the chance to be more environment-friendly. Training guardian dogs is a better alternative any day than using traps, weapons and poison. Llamas and Donkeys are really efficient sentry animals, but when predators are around, they are likely to become prey. The guarding dog breeds are usually Great Pyrenees, Komondor, Kuvasz, and Maremma. For centuries now, farm dogs have benefitted many livestock producers all over the world, amongst whom cattle producers have benefitted the most! The mere presence of a guard dog is enough to ward off predators that reduce sheep loss and the labour as it lessens the need for night corralling. The guard dog alerts the owners to the disturbances caused in the flock by barking when it senses a predator approaching. 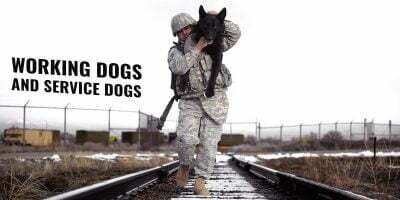 This way, these dogs protect the family as well as the ranch property. The guarding dogs are often large dogs, standing 25 inches tall or more at the shoulder and come in the category of 30 to 50 kilograms weight with ears that hang down. The colour of guarding dogs breed is usually white or grey, but some of the breeds are brown with darker markings. The behaviour of guarding dogs is often different from those of herding dogs which can be attributed to the centuries of breeding for selective traits that make for a successful guard dog. Guarding dogs are chosen to demonstrate more of pup-like or adolescent behaviour of their wild ancestor–the wolf. The growth of a guard dog progresses to have the social, exploratory and compliant behaviour as the dogs mature. This does not leave room for the crush-bite-kill behaviour to take shape and express itself. Preparing your livestock guardian dog is a venture that would not disappoint you as long as you do it in the right way. Mentioned below are some tips which you should take into consideration to raise your guarding dogs. Purchase Dogs From Working Parents — It’s best to buy livestock dogs from the parents that were used with the same species you want your dog to protect. Many livestock producers who use guardian dogs will have litters of pups available on occasion. So try to find pups from such farms where they were raised with the same animals that you have, whether it’s sheep, goat or cattle. Ideal Age To Place The Dog — The prime period to bond guardian dogs with the domestic animals is between the ages of 8 to 16 weeks. So it’s essential that the guardian dogs should be placed with the livestock that they will grow up to guard during their primary bonding period. A recently weaned guardian dog seeks the company of a herd of lambs. We all know that young animals raised in close association with other animals develop lifelong bonds. Time To Release Into a Larger Area — Once the dog gains the confidence of being in the company of the protected species and becomes a full-time member of the flock, he can be released into a larger area with the entirety of the flock. A steady process of adding animals along with widening the range of the pasture allows the guard dog to get used to its surrounding and the larger flock of farm animals that they are supposed to protect. This way the dog harbours self-confidence in its guarding duties as he grows. Give Proper Heed And Praise To Your Guard Dog — Farm owners must be capable of calling and handling their dogs with care. So reinforce the human-dog connection to ensure that your guardian dog is comfortable and content with your working partner. Also, be clear in teaching the dog what you expect from it including staying within its territory. If the dog strays from the flock or follows you to the house, return him to the livestock. Starting verbal communication early on is a good idea to teach the dogs a valuable lesson. Expose your dog to a variety of experiences that he will be expected to understand later in life. Help it understand the dangers of vehicles and farm equipment and help react to encounters involving people riding bicycles and motorcycles. Early exposures to new experiences will aid the dog in its future success. Guardian Dogs Are Different Than Normal Dogs — Raising a guardian dog is completely different than raising a pet dog that lives with you in your home. Following correct and proper methods of training will ensure that your guard dog performs his tasks faultlessly for the rest of its life. 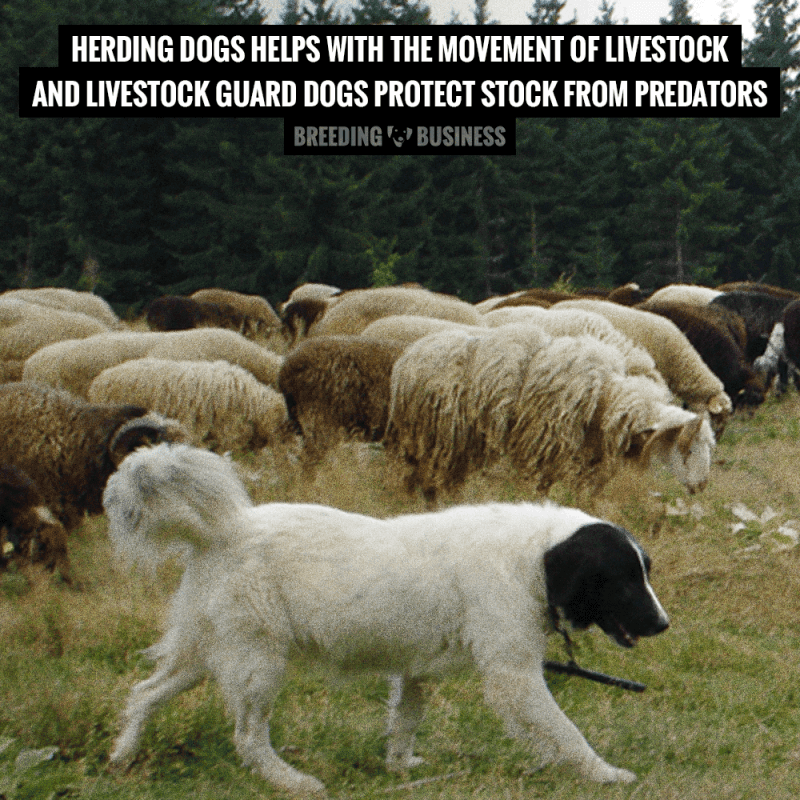 Livestock guardian dogs come with an inherent ability to guard who they feel connected to. When you bring a guard dog home, train him to spend the night where you expect him to stay as an adult dog. This means spending more time around the stock and not in your house as it will enhance the bonding between the dog and other livestock animals. It’s important to have your livestock guardian dogs bond with your stock so both are comfortable with each other. The primary goal when raising a guard dog is to ensure complete socialisation and bonding with the animals that he will care for in the future. Early relationship of guardian dogs with livestock animals will hone the natural instincts of the dog to establish a bond with the domestic animals and birds. Guardian dogs require regular exercise and interaction with livestock to maintain a bond. Lock the dog for the first few weeks, when you are not there to supervise. You can use a large dog kennel to keep it in the barn with the goats during his puppy phase. It will allow the dog to smell and be out with the goats and chickens, but the fence will keep it away from developing any habits of chasing the livestock. Also, keep in mind to never throw your dog in with your livestock and expect him to naturally take on the role of a livestock guard dog. The Great Pyrenees without any training does not make for a good livestock guardian dog but, when you invest time in teaching it well, you will have a dog who knows what he is expected to do! If the dogs are left to make their own choices, they would run the animals helter-skelter. Same for Border Collies, who also hold the title of the most intelligent dog breed; they will not be born fully-trained sheepdogs! For the first few months keep close tabs on the dog and discipline him to fend off any unnecessary action toward the animals. This includes chewing, chasing, and biting. By discipline, we don’t imply kicking or hitting the guardian dog as it can ruin the demeanour of the dog. By discipline, we mean to give him command such as “NO” and then walk away from the dog and pay no heed. Always pet and feed your dog when he is with the livestock and not when he is away from them so that he never develops the habit of being possessive of his food. The protective behaviour of these dogs is mostly instinctive and the correct training brings out his natural instincts that mature into useful work behaviour. If a pup is too playful or aggressive, you must take remedial measures before this mischievous behaviour transforms into a rough behaviour. Just like toddlers, pups tend to grasp things and learn easily right from the beginning. Use the command “NO” and give the pup a brief shake by the scruff to make him behave properly. This is an effective way of scolding pups who are extremely playful towards lambs. To set this behaviour right, introduce these pups to larger lambs or yearlings that will not put up with the pup’s playful nature. If the pups misbehave, isolate them briefly from the sheep in a manner where they can still see them. This will go a long way in teaching them to behave appropriately. Owners should make it a habit of using the command “NO” often when the dogs chase the cattle and sheep down or jump on people. You must train them to arrive at the spot as soon as you command. Make sure that this experience is pleasant for the dogs by praising them or giving them treats so that they know they’ve been rewarded for being good. Farm dogs must be trained to walk when on a leash because at times, it becomes necessary to lead the dogs or tie him temporarily. Independence is the basic nature of a guard dog so further training may be a bit over the top. In due course, the guard dog will learn and adapt itself to work without human supervision. Upon reaching a certain level of development, farm dogs will begin to demonstrate territorial and defensive nature towards predators that may pose a threat to the flock. There is no standard age as such at which a guard dog matures. There are various signs that you can keep an eye on as these will let you know that a dog is ready to take on the role of a guardian. Male and female dogs both will use raised leg to urinate instead of squatting, leaving off their scent and marking their territory. Barking at things that are fairly new becomes more expected and direction oriented. Dogs become more active and for longer periods of time. The duration and frequency of patrolling activities increase considerably. Dogs will become more interested in sheep than humans. These behavioural attributes can be extremely useful to determine if farm dogs have attained maturity. Also, guard dogs must be large enough to look after themselves in case they come face-to-face with native predators. A major aspect of raising guardian dogs is to teach them how to respect boundaries. Supervise and correct any attempts if the dog goes over or digs under fences. When you are near your dog, use the time to help him bond with the stock animals and set up the enclosure with hot wires. Also, allow the dog to learn the consequences of crossing electric fences. Also, farm gates should be included in the training. Livestock guardian dogs are smart and will figure out that if not the fences then the gates are good for them to cross over. You should train your dog to not cross the gates unless invited by you or to move with the flock. While raising a guardian dog, teaching him respect for fences and gates will go a long way in eliminating the core problem seen in livestock guardian dogs. So, when you bring a new puppy to the farm, make sure you walk the perimeter of your property every day for a few weeks so that the dog understands his boundaries. Irrespective of the fact that guard dogs spend the majority of their time with the flock, they still need human care and supervision. The overall health of the farm dogs is extremely important so that they can perform their duties well. You must provide the dog with enough food and water to sustain their level of activity, and in case of stormy weather conditions, make arrangements for a sturdy outdoor kennel. Since guard dogs lead a very active lifestyle, it’s important that they consume nutritious and high quality food. You must ensure that the food is easily accessible because if the dog has to search for food, he is likely to spend less time patrolling and protecting the livestock. Prefer grain-free dog foods with complex carbohydrates and high-quality proteins to deliver a constant amount of energy throughout the day. During training sessions, go with small training treats for dogs or if you can afford them, place a bulk order for single-ingredient dog treats. Proper medical care has to be given right from the early stage. Puppies should be given the vaccination series to protect against rabies, parvovirus and other viruses. These vaccinations should be boostered on an annual basis to keep viruses carried by other dogs and wildlife at bay. Since the dog will be spending the majority of his time in a pasture environment, chances are that they are more likely to be carrying worms. So, regular de-worming should be done. Other common problems may include mats in the fur, ear and eye infections and allergies. Consult your vet and keep the spots dry as it can cure the problem. Use dog trimmers to occasionally trim your dogs as it is an important part of keeping it healthy. You should also give thought to heart-worm. Also, a regular check-up should be given to the dog to check for cuts, abscesses and changes in behaviour or weight. Observing your dog will help you realise whether he needs professional care or not.